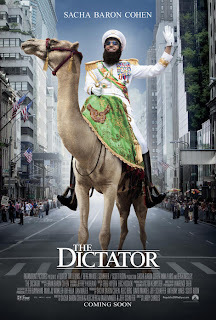 Synopsis: When Admiral General Aladeen (Baron Cohen), the vicious dictator of the fictional North African country of Wadiya, is called to the United Nations in New York City, his uncle Tamir (Kingsley) has him kidnapped and replaced with a lookalike. Aladeen must then find a way to stop his uncle’s plans to make Wadiya a democracy, and plenty of racist and stereotypical jokes ensue. Andrew: Hello readers! We’re officially starting to get into the hectic schedule of summer movies for us here at Two Tickets For… with a lot of big name movies having come out this month with more to come soon. Thankfully we were helped out this week by getting a new release coming out on a Wednesday, so we went and saw it so we could get you this review! 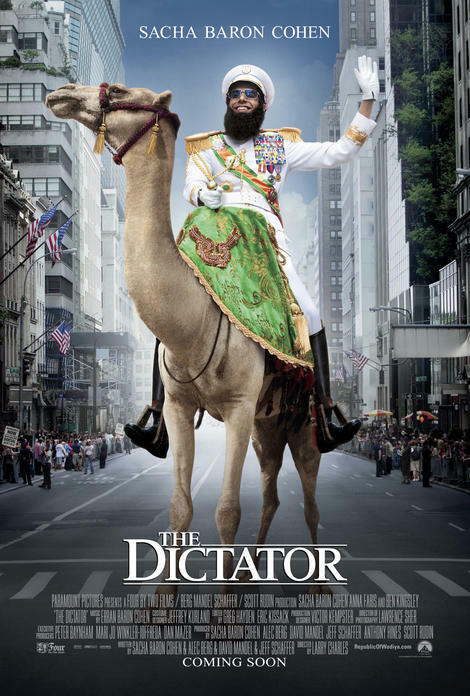 Tonight we saw Sacha Baron Cohen’s new comedy The Dictator, and I have to say right off the bat, Sarah, it was definitely different than Cohen’s previous starring vehicles, but it wasn’t as good. Sarah: It’s almost as if a scripted movie didn’t agree with him. We’ve seen him in bit parts and in other movies, but this was the first we’ve seen him in a starring role in a non-mockumentary style. And I was a little disappointed. The storyline was weak, it was choppy… I mean, while there were plenty of laughs, some seemed to be completely separate from the rest of the movie. A: I know exactly what you mean. As we were leaving the theatre I said I felt like this was just a series of skits that were hastily put together in an attempt to make it a coherent story. You’re absolutely right in that there are plenty of funny moments and jokes, but altogether it’s just a weak feature film. While watching the movie I almost felt uncomfortable and it wasn’t because of the nature of the jokes necessarily (because plenty of them are racist or stereotypical) but because it seemed like there would be about five jokes in a particular scene and only one or two of them would make me laugh. It felt like watching a comedian struggling on a live stage. S: And I have to admit that I got a little tired of the stereotypical jokes after a while. I agree! It was definitely reminiscent of watching a struggling stand-up comic. The jokes became redundant, they all kind of went along the same lines, and while there were ones that were funnier than others, there was never a time when the whole theatre laughed together. And in that sense I feel like the movie failed. 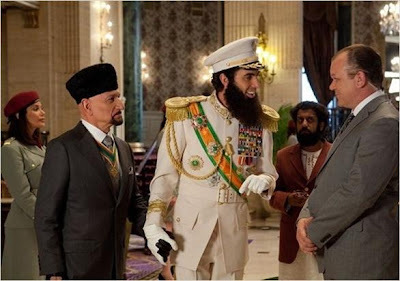 There’s one scene in particular where Baron Cohen’s Admiral General Aladeen learns to…how do I put this...pleasure himself…and it was one of the most uncomfortable scenes I’ve ever had to sit through. It went from funny to “Oh my gosh I need to turn away from this.” It was just…not good. A: I can see where you’re coming from with that particular scene. I personally found it hilarious, mainly because of the physical acting by Baron Cohen and the song choice during the scene (Kelly Clarkson’s “A Moment Like This”), but I see what you mean. 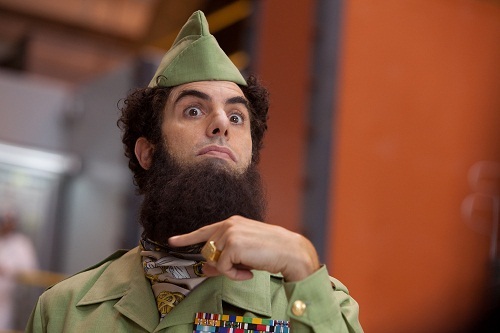 Here’s the thing for me – I like Sacha Baron Cohen and I think he’s a comedic genius. Borat was absolutely brilliant and I also thought Bruno was pretty funny. But where Cohen got his laughs in those films by getting actual responses out of unknowing REAL people, it seemed like he was forcing a LOT of the jokes this time to elicit similar responses from the audience. It just didn’t feel the same. I credit him for the attempt but the execution was flawed. S: I would agree with you. I’d say my favorite part of the movie was the music itself. If you listen to the music you recognize popular tunes, but what they’ve done is “translated” pop music songs into Aladeen’s language, so it makes it seem relevant but also adds a comedic twist to the score. A: Good point. I first noticed that when I recognized the music for R.E.M.’s “Everybody Hurts” but then it was NOT Michael Stipe singing. There are other examples I can’t remember right now, but I also don’t want to spoil much of anything else. Other than that, I felt like there were other gallant efforts from the supporting cast, especially Jason Mantzoukas as Aladeen’s former head nuclear scientist (and is hilarious on The League), but that all in all it was just a scattershot movie. S: I thought Anna Faris (The House Bunny) as Aladeen's love interest, Zoey, was one of the elements that did not work with the storyline. I understand the main chracter’s arc to find love, but it was a low-tier plot that just didn’t do it for me. I think it’s safe to say, while we got a few chuckles out of the movie, we were not super impressed. A: Yeah, if you’re a real big fan of Sacha Baron Cohen’s material then I’m sure you’ll enjoy the movie to the extent that I personally did, but if I’m being objective, the funniest part of the movie tonight was the red-band trailer for Seth McFarlane’s Ted and the teaser trailer for next year’s Anchorman sequel. S: I think it’s a shame that it didn’t pan out after all of the publicity this movie has been getting, and I would definitely say wait to Netflix this one, don’t spend the money to see it in theatres.